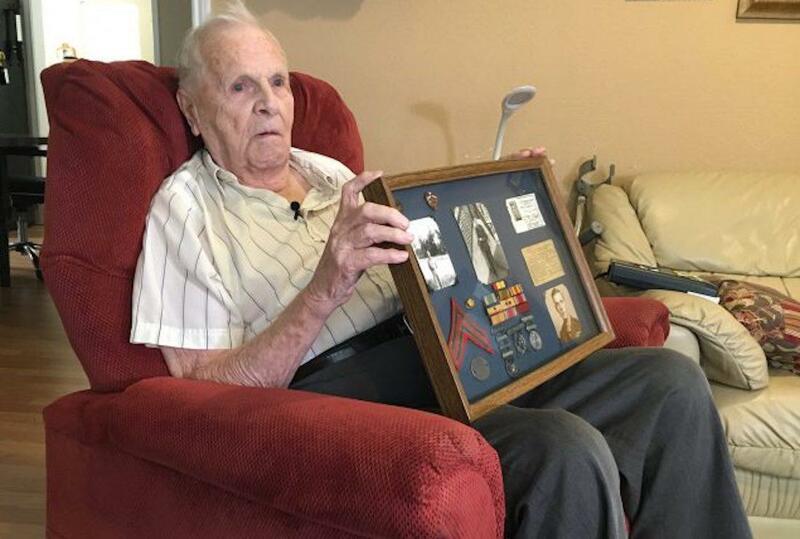 KAUFMAN, Texas -- Police are searching for the suspect who pushed an elderly veteran as he was protecting the American flag outside his home, CBS DFW reports. World War II veteran Howard Banks, 92, is legally blind, but his memory is sharp. He said that a day before his birthday earlier this month, he heard someone outside his home pulling the American flag down from its pole, so he went outside to investigate. "I walked out, hanging onto the railing and stepped down. That must've startled them," Banks said. Banks was determined to protect his flag after someone shredded his previous American flag and ripped up his Marine flag about a year ago. "They could see me. I couldn't see them," he said. "I turned and looked in the other direction, and about then -- 'wham!' They knocked me down." The person trying to take the flag down ran off while neighbors rushed in to help the veteran, who was left legally blind by a flare on Iwo Jima, The Associated Press reported. Banks has several bumps and bruises. He said he also twisted his knee. "On this forearm, it's kind of sore and rough," he said. "Both of them. I've still got soreness here, but I'm durable. I can take it." The injuries he suffered won't stop him from his life's mission to honor veterans who sacrifice and serve by displaying his American flag. "I think we all had that same feeling, that the flag was our identity. We were Americans," said Banks. "The fact that I'm getting older, and the less I can do… at least I can still do that." Banks said he didn't hear the suspect's voice so he is unsure if the person is a man or woman. In the meantime, his daughter, as well as neighbors and officers, are keeping a close eye on him and his flags.